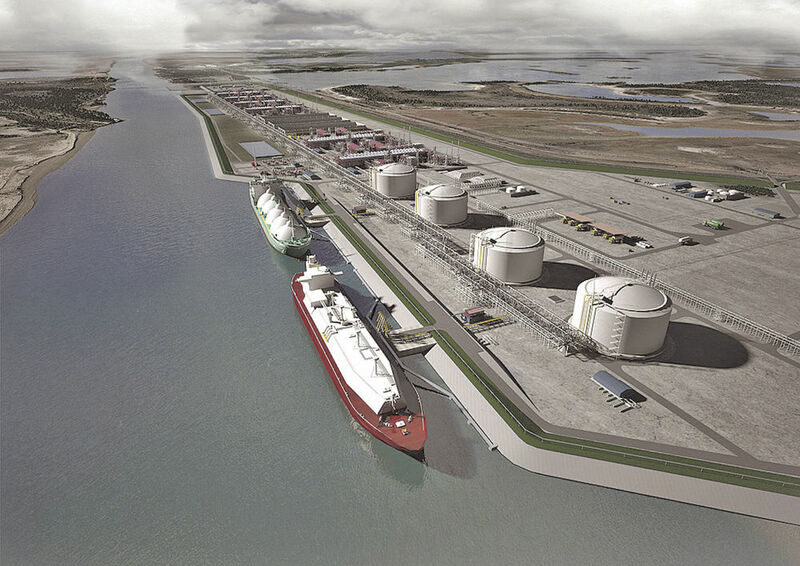 This is a rendering of the proposed Rio Grande LNG plant located at the Port of Brownsville. BROWNSVILLE — The U.S. Army Corps of Engineers has informed two LNG companies proposing plants at the Port of Brownsville that their applications are no longer being reviewed due to missed deadlines for requested information. In a letter to Annova LNG, one of three companies seeking approval from USACE and the Federal Energy Regulatory Commission to build liquefied natural gas export terminals at the port, USACE Galveston District Policy Branch Chief Robert Heinly wrote that Annova’s permit was being withdrawn, though the company could apply at a later date. Heinly noted that the USACE sent a letter to Annova on May 21 requesting complete information about the natural gas pipeline that would supply gas to Annova’s proposed LNG facility. The company was given 30 days to respond or have its permit withdrawn. Annova CEO Omar Khayum’s request for an extension until Nov. 2 was deemed “not acceptable” by USACE, which then pulled Annova’s permit. Heinly noted the company is free to reapply at a later date. In a statement, Annova said it is continuing to make progress on a mid-scale LNG export terminal at the port. “We are moving forward in confidential commercial negotiations with a third-party pipeline company for the transportation of natural gas supplies to the export facility, and expect to reach a point in the negotiations by this fall when we can provide more information,” read the statement. The company said it will resubmit its application at that time. Texas LNG, which also is planning an export terminal at the port, received a similar letter from USACE and had its permit pulled for missing a deadline to provide information. However, Texas LNG Chief Operating Officer Langtry Meyer wrote in an email that the company remains in close communication with the USACE and is finalizing its response to the request for data, which it will submit soon and, in the process, reinstate its permit application. He wrote that Texas LNG anticipates full FERC approval and a Final Investment Decision (whether or not to proceed with construction) next year, with the first phase of production of 2 million metric tons per year to start in 2023. Meyer noted that the company had received a letter of recommendation from the U.S. Coast Guard confirming the “suitability of the Brownsville Ship Channel for Texas LNG’s marine traffic as it relates to safety and security.” Also, Texas LNG has received letters of support from the U.S. Department of Transportation and the U.S. Department of Defense, he wrote.